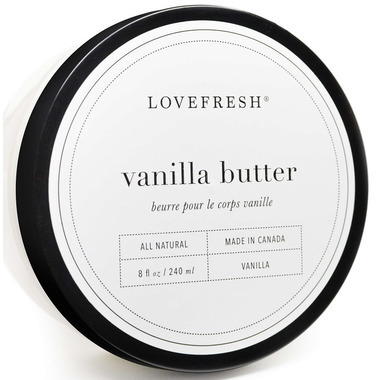 Lovefresh Vanilla Body Butter is a thick, rich and intensely hydrating formula that is packed with Aloe Vera, Chamomile, White Willow bark and Calendula extracts. Steeped in gorgeous scents (including natural lavender and lemon verbena essential oils) this body butter is absorbent and will leave your skin feeling soft, supple and smooth. I want to first start out by saying I'm in love with this product. It's all natural and Canadian . Its rich and luxurious. Smells amazing .Keeps you hydrated all day. I am in love with this product. It smells amazing and is wonderfully thick. It leaves skin smelling and feeling good all day. I love the ingredients and the fact that it is a Canadian company. I just hope it comes back in stock! First off, this smells divine. Canadian made and no toxins! It's a little stickier and harder to manipulate than some other body butters that I've used but it does leave the skin soft and smooth. Stays hydrated all day.